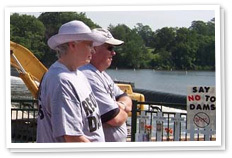 Friends of the Fox River About Friends of the Fox River; our mission and what we do. Friends of the Fox River is a 501(c)(3) nonprofit organization made up of citizens and organizations taking action to protect and maintain the quality of the Fox River and its tributaries. Through our programs and activities, we encourage both adults and students to become involved in protecting the river and its watershed. Each year, we have over 4,500 citizens participating in our programs including our water quality monitoring program (Fox River Watershed Monitoring Network), river and stream cleanups, river habitat improvement projects, and water quality education events. Friends of the Fox River has been working for more than 25 years! Incorporated in 1990, Friends of the Fox River is a non-profit organization dedicated to building a watershed of caretakers in the Fox River Valley. We are concerned citizens taking action to protect and maintain the quality of the Fox River and its tributaries. In Illinois, 16 dams impede the Fox River’s flow. Most Fox River dams serve no purpose. River dams degrade water quality. We advocate the adoption of practices by individuals and governments that will best protect and enhance the quality of the watershed. We advocate for the river when policies that effect the health of the watershed are debated. We educate citizens about river issues through our publications and events. We train citizens, teachers, and youth group leaders to monitor the health of the Fox River and its tributaries. We use the stream data collected by our Monitoring Network volunteers to keep a watchful eye on water quality trends and take action when appropriate. We organize river habitat improvement projects. We organize Fox Rescue cleanup events each May and September where thousands of pounds of trash are removed from the shores and waters of the river by volunteers throughout the Fox River Valley. We participate in the Fox River Study Group, a diverse coalition of river stakeholders working to improve the current water quality of the river and to prevent future problems. We have trained nearly 400 adults to monitor water quality in the Fox River watershed. We have established over 100 stream monitoring sites that are monitored by volunteers annually. We have enabled teachers to involve nearly 4,000 students annually in water quality monitoring and stewardship activities. We have provided volunteer-collected water quality data to water quality resource professionals who use the data for antidegradation studies, to community decision makers who request information about their local streams, and to educators who use local water quality data for educational purposes. You paddle it. You bike it. You fish it. You enjoy it.